Heaven 11 announces new ‘Billie’ amplifier | What Hi-Fi? Billie has been produced by Canadian audio company Heaven 11, a team comprising “technology masters, designers and craftsmen”. It’s named after Billie Holiday and is due to launch on Kickstarter later in the summer. Heaven 11 believes a traditional stereo system is the best way to experience music, and says “it’s not about multi-room, it’s all about in the room”. So while you won’t be able to use the amp for multi-room purposes, you are given a generous selection of connectivity options. Billie comes with a moving magnet phono input, two RCA inputs, two digital optical inputs and aptX Bluetooth for wireless streaming. You’ll also find a built-in headphone amplifier and subwoofer output. 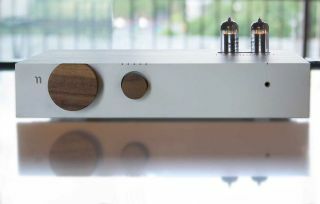 Billie also features a tube preamplifier and Class D Icepower amplification by Bang & Olufsen. Power output is rated at 125 watts into 4 ohms and 60 watts into 8 ohms. Finally, there’s a built-in ESS 9018K2M DAC that can handle high-res audio up to 32-bit/384kHz. Everything is housed within a machined aluminium casing with hardwood knobs on the front. Billie will launch on Kickstarter in the summer with early bird pricing starting at $595. Regular prices will be $895 for a standard anodised aluminium finish or $995 for a black anodised finish.